Quantum Dynamic Bond Fund – QDBF is an open-ended debt scheme with defined credit exposure and dynamic maturity profile. The fund will tend to invest in high quality debt and money market instruments. The fund manager would have the flexibility to actively manage the portfolio based on interest rate views. If interest rates are expected to rise, it will invest in short term securities that mature early and re-invest the proceeds at higher rate. Conversely if interest rates are expected to fall the scheme would invest in long term bonds to lock in high interest rates. And if interest rates fall subsequently the value of bond will increase providing capital growth. 2. Ensures to minimize your credit risk (Credit risk is the risk of loss due to default by a borrower.) by investing majority of its assets primarily in Government securities or in PSU bonds which are rated as AAA /AA and so forth by a SEBI registered credit rating agency. 3. Controls interest rate risk by active interest rate management. The macro economy research team actively tracks and forecasts interest rate outlook and the portfolio maturity profile is altered at appropriate time based on interest rate views. 4. Offers a solution for all your long term debt investment needs. 5. Has no exit load and offers low expense ratio. Past performance may or may not be sustained in the future.Returns are for Growth Option. "@ shows the current value of Rs.10,000/- invested at the beginning of a given period. The Schemes has been in existence for more than 3 year but has not yet completed 5 years period since inception. What is Quantum Dynamic Bond Fund or QDBF? Debt Funds or Income Funds are mutual fund schemes which invest in debt securities and money market instruments. They aim to generate income and moderate capital appreciation with relatively lower risk. The Quantum Dynamic Bond Fund is a debt fund which gives the fund manager flexibility to actively manage the portfolio based on interest rate view. The fund will primarily invest in Government Securities and PSU Bonds / instruments rated AAA/ AA and so forth, thereby minimizing Credit Risk. It will focus on capital appreciation by taking positions when the fund management team feels interest rates would come down and try to minimize capital losses when the fund management team feels interest rates are going up. Quantum Dynamic Bond Fund – QDBF is an Open Ended Dynamic Debt Scheme Investing Across Duration with defined credit exposure and dynamic maturity profile. The fund will tend to invest in high quality debt and money market instruments. The fund manager would have the flexibility to actively manage the portfolio based on interest rate views. If interest rates are expected to rise, it will invest in short term securities that mature early and re-invest the proceeds at higher rate. Conversely if interest rates are expected to fall the scheme would invest in long term bonds to lock in high interest rates. And if interest rates fall subsequently the value of bond will increase providing capital growth. • QDBF offers a solution for all your long term debt investment needs. • QDBF will be managed by an experienced Fund Management team with proven track record of managing debt products. The research will be undertaken in-house; it will not be dependent on third party research. • QDBF minimizes credit risk by investing majority of its assets primarily in Government securities or in PSU bonds which are rated as AAA /AA and so forth by a SEBI registered credit rating agency. The fund will not invest in private corporate paper this reduces the inherent credit/default risk of the portfolio. Credit risk is the risk of loss due to default by a borrower. What is the Investment Objective of Quantum Dynamic Bond Fund? To generate income and capital appreciation through active management of portfolio consisting of short term, long term debt and money market instruments. What are the different features available under Quantum Dynamic Bond Fund? Systematic Investment Plan (SIP) (on an going basis): This feature enables investors to save and invest periodically over a long period of time. Click here to know more about SIP in detail. Systematic Withdrawal Plan (SWP) (On an going basis): This feature enables an investor to withdraw amount/units from their holdings in the Scheme at periodic intervals through a one-time request. Click here to know more about SWP in detail. Systematic Transfer Plan (STP) (On an going basis): This feature enables an investor to transfer fixed amounts from their accounts in the scheme to another scheme within a folio from time to time. Click here to know more about STP in detail. Switch options: Click here to view switch matrix for the applicable NAV. Where will Quantum Dynamic Bond Fund invest? What is the Current portfolio? The above asset allocation is only indicative and may change from time to time, keeping in view the market conditions and applicable rules and regulations. Quantum Dynamic Bond Fund will offer active interest rate management by altering the maturity profile of the portfolio at appropriate time, based on interest rate views of the fund manager. The scheme will not invest in repo of corporate debt securities and Credit Default Swaps (CDS). Major portion of assets will be invested in Government bonds and/or PSU Bonds. What is the Benchmark of Quantum Dynamic Bond Fund & Why? The Benchmark Index for the Scheme is the CRISIL Composite Bond Fund Index. The Crisil Composite Bond Fund is an index comprising of Government securities and AAA/AA rated Corporate bonds. Since QDBF would invest a large proportion of its assets in government securities and top rated PSU companies, the Crisil Composite Bond Fund would be an appropriate benchmark for it. Who is managing Quantum Dynamic Bond Fund? What is the Minimum amount I need to invest or redeem in Quantum Dynamic Bond Fund? Please refer below table for the minimum amount required to invest or redeem in the Quantum Dynamic Bond Fund. Growth Option Rs. 500/- and in multiples of Re. 1/- thereafter. Monthly Dividend Payout Option Rs. 500/- and in multiples of Re. 1/- thereafter. Monthly Dividend Re-investment Option Rs. 500/- and in multiples of Re. 1/- thereafter. How do I invest in Quantum Dynamic Bond Fund? What is the current expense ratio of the Quantum Dynamic Bond Fund? The current expense ratio of the Direct Plan of the Quantum Dynamic Bond Fund is 0.67% p.a. with effect from July 1, 2017 (Post GST). The expense ratio for the Regular Plan is 0.79% p.a. with effect from July 1, 2017 (Post GST). Effective 01 Dec 2018, the base TER has undergone a change, however the Total Expense Ratio remains the same. What are the entry and exit loads for Quantum Dynamic Bond Fund? What are the different options/facilities available under Quantum Dynamic Bond Fund? The scheme offers Growth Option, Monthly Dividend Payout Option and Monthly Dividend Reinvestment Option. Can I hold the units of the Quantum Dynamic Bond Fund in Demat mode? 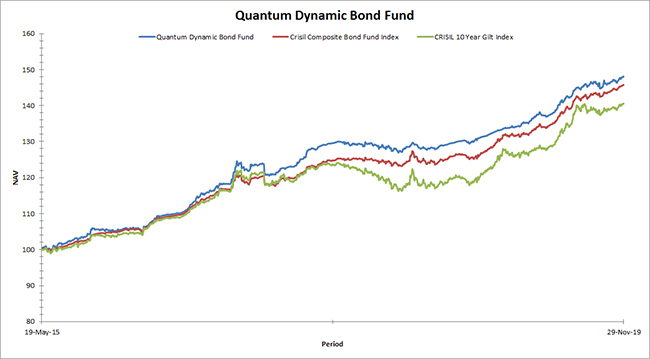 How has the Quantum Dynamic Bond Fund performed? To check the performance of the Quantum Dynamic Bond Fund you will have to go through the current factsheets. Tell me more about the NAV applicability and cut-off timing of Quantum Dynamic Bond Fund. NAV applicability refers to the NAV at which a transaction is affected. A cut-off time is set by the fund and all investments or redemptions are processed at that particular NAV. This NAV is relevant if the application is received before that cut-off time on a day. A different NAV holds if received thereafter. Every Mutual fund follows standard cut-off timing depending on the scheme type which is in compliance with SEBI guidelines. To know more about the NAV applicability and cut-off timings of the Quantum Dynamic Bond Fund please click here. Tell me about the Tax implications if I invest in Quantum Dynamic Bond Fund.